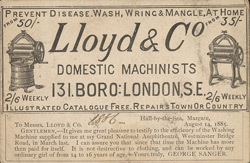 This is an advertisement for Lloyd and Company who specialised in manufacturing domestic appliances and machinery. The first known record of a washing machine appears in 1677 in the diary of Robert Hooke but it was not until the 19th Century that machines appeared that mixed water with clothing and did not damage the material. Most early models were designed on the same principles as butter churns but by the 1860's the mechanics of the washing machines were more sophisticated and could reproduce both the circular and vertical motions used when hand washing with a dolly. These machines were expensive however and it was only very rich families that could afford to buy them.